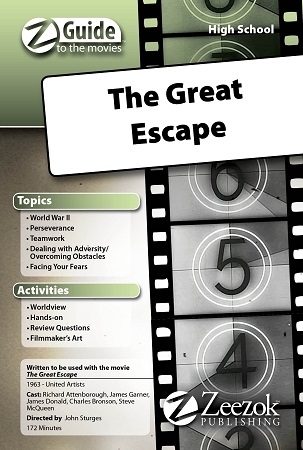 Zeezok Publishing's Z-Guide to The Great Escape is a great way to incorporate media into your study of World War II. Frustrated by the frequent escape attempts of certain Allied prisoners of war the Germans build a state-of-the-art facility to house their most troublesome POWs. By doing so they put every escape artist in Germany in one location including the mastermind behind many previous breakouts. At a meeting on their first night in the new camp Big X outlines their most ambitious project yet three simultaneous tunnels and a mass exodus of two hundred and fifty men. Will the size and scope of the operation make the attempt detectable by their alert captors or will the plans purpose to harass the enemy and divert resources from the battle lines succeed? You'll have to watch The Great Escape to find out! This Z-Guide contains a topic overview a movie synopsis and ten learning activities based on this exciting film. Learn more about the real Stalag Luft III and the actual Great Escape. Sketch a scene from the movie or identify ways to survive in a POW camp. Evaluate your own beliefs with the Worldview Activity probe the directors mind with The Filmmakers Art activity and get the entire family involved with the For Family Discussion section at the end of the guide. Choose those activities which best fit your students course objectives areas of interest or time schedule. You'll enjoy this tense drama even more with The Great Escape Z-Guide. This Z-Guide is based on the movie The Great Escape (1963). You can view a trailer for the movie below.